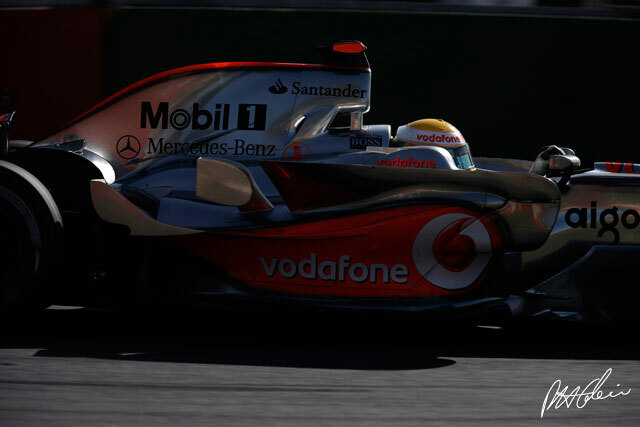 The 2008 Australian Grand Prix was a blockbuster. As others lost their cool in oppressively hot temperatures, Lewis Hamilton kept everything under control and, a year after his stunning F1 debut, began his World Championship challenge for 2008 with a victory. An assured one, that had the class of a champion written all over it. There were smiles aplenty on the podium, as Lewis and third placed Nico Rosberg have been friends since they were schoolboys in the world of karting. But the biggest smile of the day belonged to McLaren boss Ron Dennis. It does not make up for what has happened to McLaren in the course of the last 12 months, but it does suggest quite clearly that McLaren does not need Ferrari technology to win Grands Prix victories. Ferrari were the chasers in Australia and while the car is clearly quite good, too many mistakes were made and the race ended with two mechanical failures. Ferrari is still going to be a threat as the year develops. It was hard to judge exactly how strong Ferrari was in Melbourne, because things went wrong at every possible moment. Qualifying was spoiled and in the race Felipe Massa's hopes for glory disappeared at the first corner when he spun into a wall, in an accident all of his own making. He recovered from that only to fall victim to David Coulthard later in the race, the two men colliding in a messy fashion, and then arguing about who was to blame. Even then Massa was able to keep going, but finally his engine gave out. A similar fate befell Raikkonen, but he had been hobbled by mistakes as well. His race had begun in brilliant fashion with a strong start, despite a heavy fuel load. As the lighter cars began to pit he moved through the field to run third and eventually challenged Heikki Kovalainen. But at that point The Ice Man melted. He tried a wildly optimistic move on his fellow countryman and sailed off into the kittylitter. He got back on track again and went into the pits, and so was 11th and last on lap 32. Attrition had been high, but with fuel to get to the finish Kimi set off again, with hope in his heart. He closed on Timo Glock's Toyota but then made a fairly basic mistake, putting a wheel on the grass and spinning off. He rejoined again, gained back ground thanks to a Safety Car and was running seventh when his engine failed him. He would end the day with a World Championship point after Rubens Barrichello was disqualified for driving through a red light. "We should not react in an over-emotional way to this," said Stefano Domenicali, Ferrari's new sporting director, who might have hoped for a better start to his time in charge. "The whole team has not performed to our usual standard, so we must roll up our sleeves and react." Hamilton led all but a few laps of the race, with only his team-mate Kovalainen getting a look in during the pit stops. Lewis would build a lead and then have it taken away by a Safety Car. He would repeat that process twice, but he made no major mistakes and reckoned at the end of the day that he could have raced harder, if that had been necessary. The car, he said, was even better than last year's, which ought to have won him the World Championship at his first attempt, but for mistakes in the final races. "It's a dream to drive," he said. "A great car." If there was one disappointment for the team it was that Heikki Kovalainen, who thoroughly deserved to be second, ended up back in fifth place. This was largely due to being caught out by the Safety Car that followed Timo Glock's accident. Heikki had been leading when the crash occurred and had to stay out longer than planned. By the time the race restarted he was back in seventh. There followed a nice dice with his old Renault team-mate Fernando Alonso, and on lap 57 Heikki overtook Alonso with a glorious move. Luck was not on his side, however, as he had oil on his visor as a result of Sebastien Bourdais's Toro Rosso having blown up. Kovalainen tried to wipe his helmet with the back of his hand and, in doing so, knocked on the pitlane speed limiter. Alonso retook the place. That did little to effect Ron Dennis's joy at victory, although a 1-2 would have been even better. "Ron has been through a lot," said Hamilton. "so has the team, but we have pulled through and it shows in the results. I am glad that he is happy. It is an emotional thing to win the first Grand Prix of the season, especially with all the winter testing, the whole build up; never knowing whether you are going to have the pace of everyone else; whether you are going to win; whether the car is going to be reliable. When you come out on top it is a real relief and a great satisfaction." There was great satisfaction too at BMW Sauber, but also frustration as well. Robert Kubica drove a super race, running second early on but then being stuck in traffic after his early pit stop. This meant he was fourth and then the mid-race Safety Car after the Massa-Coulthard collision offered an opportunity to get fuel to go to the finish. This dropped him back to seventh, but his chance to make up ground was spoiled when the next Safety Car intervened, just as Robert needed to be going fast. To add insult to injury he was then hit from behind in the queue of cars by Kazuki Nakajima. In the end Kubica went home with nothing, which was not really fair. His team-mate Nick Heidfeld would finish second after a steady race. He was able to pass Nico Rosberg during the pit stops and was happy to see Raikkonen take care of himself. When Kovalainen fell victim to the Safety Car and Kubica was in the wrong place at the wrong time, he was able to cruise home in second. He was never a threat to Hamilton. Rosberg was third and there was much rejoicing at Williams, not least because Nakajima also came home with points, despite several incidents. The team thus is second in the Constructors' Championship, although the FIA stewards decided that Nakajima should have his wrist slapped for the incident with Kubica and so he will have a 10-place grid penalty in Malaysia. Nonetheless, the result was a clear sign that Williams is again a force to be reckoned with. Renault took fourth in the end thanks to Fernando Alonso, but it was not a great weekend for the team. Fernando went for a long first stint and stayed out of trouble. This allowed him to move to sixth, before dropping back to ninth when he stopped. He then benefited from the final Safety Car and was able to pass Kovalainen and Raikkonen as a result - one of several incidents which were missed by the TV coverage. And really it was only luck that put him ahead of Kovalainen. The Renault car needs work. Nelson Piquet's lacklustre weekend ended on lap 32, by which time he was stone last, with damage sustained in the bingle at the first corner. Hopefully young Nelson will not allow this to affect his confidence. It is hard to imagine that he cannot do better than this. The first lap accidents put paid to the ambitions of a lot of drivers. Sebastian Vettel was slow away from ninth on the grid. At the first corner the midfield was a little more bunched than normal and when the tailenders arrived, there were more cars ahead to hit. Piquet went for the inside and punted Glock. This knocked the German into Giancarlo Fisichella's Force India and Jenson Button's Honda. Vettel and Nakajima were also involved while Mark Webber went on to the grass and so lost ground. This meant that he had a close encounter with the hobbled Nakajima and Anthony Davidson's Super Aguri. The result of all this was that the local hero was out, along with Vettel, Button, Fisichella and Davidson. Nakajima and Massa had to pit. Adrian Sutil avoided all the trouble but his car stopped after just eight laps with an hydraulic failure. Next to go was Jarno Trulli, who ran sixth early on and looked quite strong until a battery failure resulted in him having his buns toasted. When this became too much to handle Jarno pitted and retired. Coulthard was next to go when Massa and he tangled on lap 26. The two did not agree on who was at fault. Massa reckoned that Coulthard had not seen him. DC said that Massa was not far enough ahead to claim the corner as his own. It was a close call but when all was said and done, it made little sense that Coulthard turned in as he did. Massa was there. In the laps that followed Massa, Piquet and Sato all stopped and so by just over half distance there were only 10 cars running. The Coulthard-Massa shunt had resulted in a Safety Car, because of all the carbonfibre on the road and the timing of the opening of the pitlane gave Sebastien Bourdais a huge advantage. He stopped on his 28th lap, while the rest of the field had to wait until their 29th. Thus he was ahead by the time they all re-emerged. From 13th place on lap 28, he went to sixth by lap 31. To give him credit, Sebastien used the bonus well and held off some better cars and looked to be on his way to fourth place after Kovalainen and Barrichello ran into trouble, but then his engine went bang with a couple of laps to go. In the end, he was classified seventh and took two points, which makes it an impressive F1 debut - at least on paper. The Frenchman will need to do more in the future to convince the cynical F1 crowd that he is a star in the making. Timo Glock was running a steady race until lap 44 when he went wide at one of the fast corners. What happened next was very frightening and questions should be asked about why there were bumps that were able to launch him into the air with such violence that the Toyota nearly rolled. For those with long memories, it was a little reminiscent of the crash in America that killed Greg Moore. Investigations are needed to make sure that such bumps are eradicated from all F1 circuits. Honda was also feeling a little aggrieved by the end of the race as Button's early departure had been frustrating and then Barrichello's was downright annoying. Rubens ran seventh early on and seemed pretty comfortable with the pace - a good sign. As Raikkonen made up ground Rubens fell back to eighth but then a shuffle after the Coulthard-Massa Safety car meant that he was suddenly fifth. He needed to stop again, but the team's plans went completely awry when Glock's crash scrambled the Safety Car, just as Rubens needed to pit. There was no option but to enter the pits when they were closed. The stop then went wrong as well as the lollipop man (in his first race in that role) let the driver go too early. Fortunately no-one was hurt but several crew members took a tumble. Rubens was, no doubt, distracted by this and drove through a red light at the end of the pitlane. The light should not have been on because the rest of the field had already gone through, but a red light is a red light and so the Brazilian was excluded from the race, despite finishing sixth on the road. Nonetheless, it was a sign that the Honda is not a bad car this year and so the team should be able to score a few points along the way. McLaren won the prize for being the happiest team, although the rejoicing at Williams was fairly boisterous as well. But there were still words of warning from McLaren as well. "It was an almost perfect race weekend for us," said Ron Dennis. "We have enjoyed a competitive weekend, but there is a long way to go and we never underestimate our opposition." Wise words after Raikkonen's amazing title comeback in 2007.